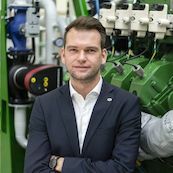 Frank Grewe graduated from the Dortmund University of Applied Sciences and Arts in early 2007 with a degree in Mechanical Engineering, and began his career in the Research & Development Department at 2G Energietechnik GmbH. His main tasks involved the design, calculation and construction of genset and CHP modules, together with optimising the gas engines used, with the abiding aim of generating the greatest possible customer benefit via the products. In 2008 Frank Grewe assumed overall responsibility for Research & Development, and in 2010 was named Managing Director of 2G Drives GmbH, a spin-off company formed from that department. He has remained in that role to this day and is still responsible for developing 2G engine technology, genset and CHP construction, software development, the training centre and engine production. In 2018, 2G Drives GmbH employed 40 members of staff and had an annual turnover of around €20 million. Since 2008, development has focused on 2G engine technology, resulting in an over 4 percentage points increase in electrical efficiency and an average performance increase of over 30 per cent across the whole 2G product range. In 2014, Frank Grewe acquired the power to act and sign on behalf of 2G Energy AG. In May 2015, he assumed responsibility for business development for the Service sector worldwide, with a focus on structure and strategy across the different product areas. Between 2015 and 2018, Service revenue increased by over 30 per cent, maintaining healthy operating margins, to over €70 million today. 2G Energy AG sales have rocketed from €21.2 million to more than €200 million (2018) over the last 10 years.